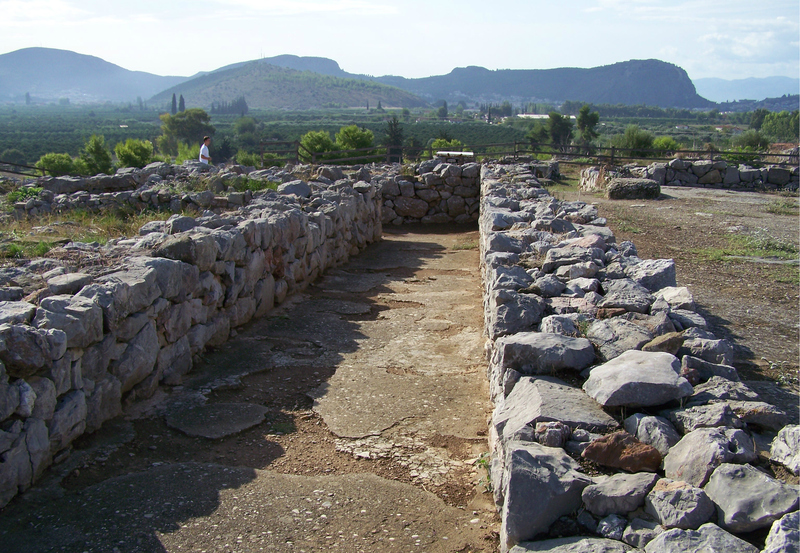 Situated between Nafplio and Argos, Tiryns is a cyclopean fortress on a low hill in the centre of the Argolid plain. The earliest human occupation on the hill goes back to the Neolithic period (about 5000 B.C.). 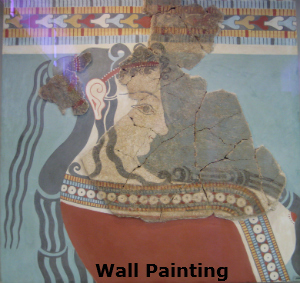 It was followed by successive settlements but their remains have been destroyed almost completely by the extensive building in the Mycenaean age. In ancient Greek tradition, the city took its name from the hero named Tirynthos, son of Argos, but was thought to have been founded by Proitos who captured it from his brother Akrisios, king of Argos, who then had the Cyclops from Lycia build for him the famous walls constructed of massive, irregular, limestone blocks, some weighing several tons. 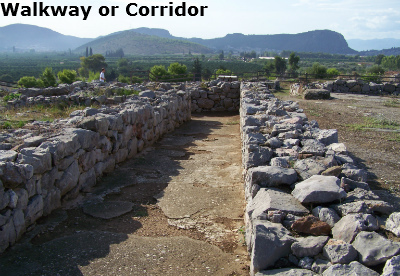 The archaeological excavations of ancient Tiryns were undertaken by Heinrich Schliemann who in 1876 opened the first trenches in the Acropolis and the site outside the walls. In 1884/5, during five months of extensive work part of the Upper Citadel was uncovered. Between 1905 and 1920, the investigations were resumed by the German Archaeological Institute on the Acropolis as in the wider surrounding area. 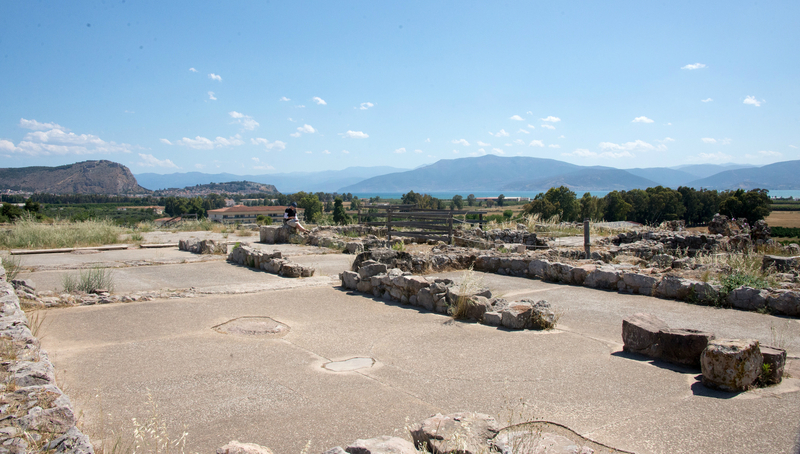 The Germans returned to the site in 1967 and excavated the whole of the Upper and the Lower Citadel, part of the mycenaean town in the wider area around the walls and part of the Cemetery of the Iron Age. Excavations continue to this day. The acropolis at Tiryns was built in three stages, the first in 1400 BC when the palace was built on the highest part of the hill. 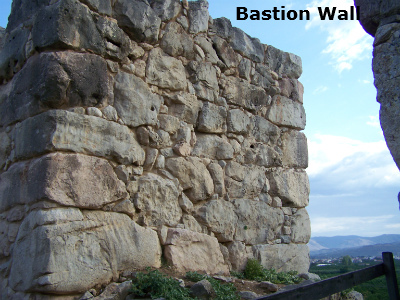 During the second stage 1300 - 1250 BC a cyclopean wall was constructed to protect the central section. 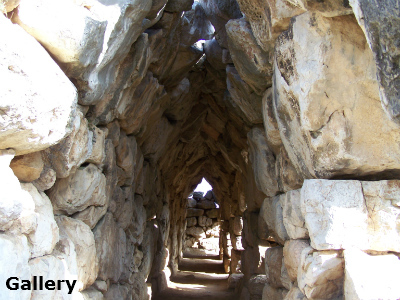 Between 1250 and 1200 BC the walls were extended to provide protection for the whole site. The entrance to the Acropolis of Tiryns consists of a large gateway. 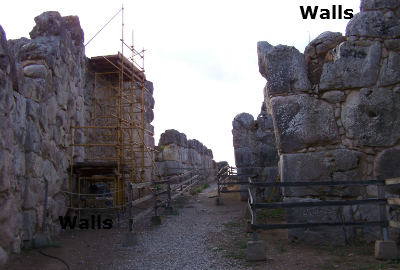 The size of this, together with the method of construction, have led archaeologists to suggest it was built at the same time and by the same architect who built the Lion Gate at Mycenae. A lot of the stonework has not survived, but you can still imagine the scale of the gateway from the remaining supports. It has been calculated that the wooden door which hung in the gateway was about 15cms thick from the marks in the stonework. The ramparts of Tiryns are very impressive as they are 7 - 10m wide and in some places are 7.5m high. The door to the palace area had a large stone threshold. There are holes for the door hinges, and marks where the socket for the wooden bar which would have held the door closed. The Propylaia leads into the great court of the palace and from here there is a staircase to the South Casemates which are similar to those in the east of the site. Built within the width of the ramparts, in the area known as the East Casemates there is a narrow gallery, about 30m long with a vaulted roof. Leading off the gallery are six rooms (casemates) which are thought to have been used as stores or barrack rooms. The citadel itself is on three levels. It is not clear what the lower and middle Citadels were used for but the remains of a pottery kiln suggest that they may have been workshops. as to the function of the Lower and Middle Citadels but the remains of a pottery kiln suggest that they may have been used as areas for workshops. The upper Citadel has the remains of thefoundations for the Great Propylon which led to the heart of the complex and the palace of the ruler- the Great Megaron and colonnaded Central Court. Smaller outer courts, a long rectangular building, a smaller Propylon, two wings of buildings on the east and west sides and the remains of at least two staircases suggest second stories to some of the buildings. The Megaron at Tiryns is the best preserved of all the palaces. The portico had two columns and the walls were decorated with seven slabs of alabaster which were decorated with reliefs of rosettes and lapis lazuli. It was the most important room in the palace. 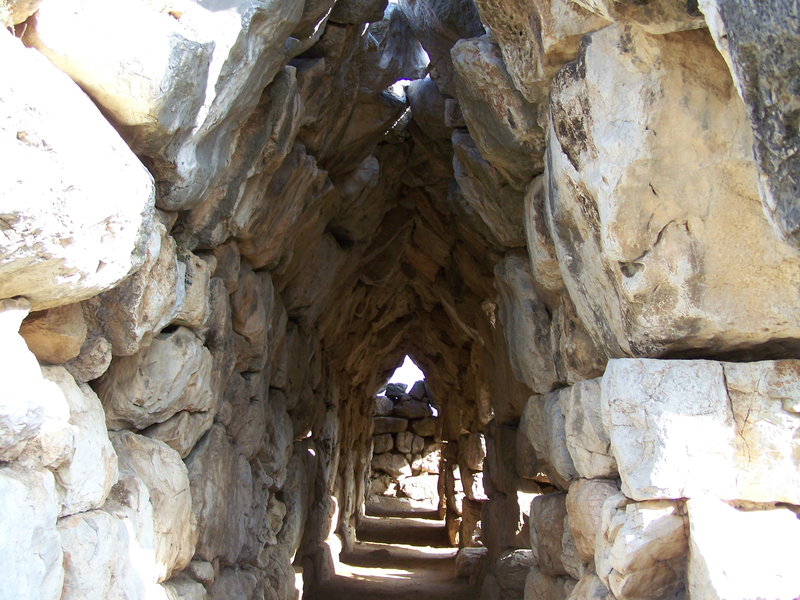 There was a central hearth with four pillars to support the roof. The floor was plastered, and decorated with painted squares. Designs included sea creatures such as octopus and dolphins. The walls were covered with paintings, the dominant scene being that of a royal hunt. Among the royal rooms is a bathroom, where the highly polished stone floor has holes drilled into it for drainage. 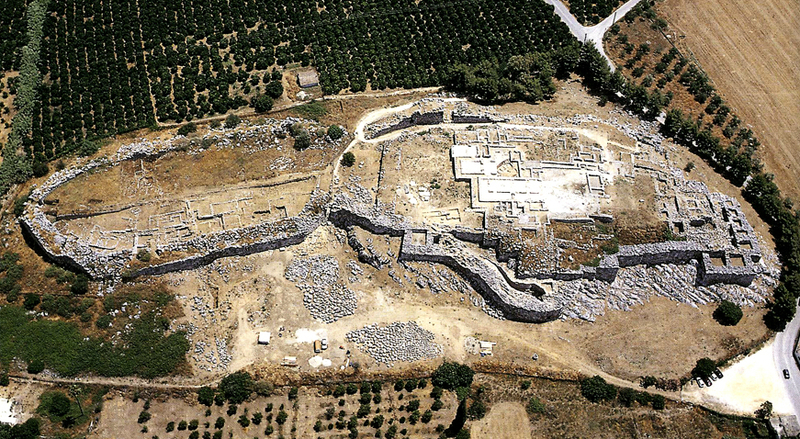 Evidence exists of settlement around the citadel dating from the 14th century BC. 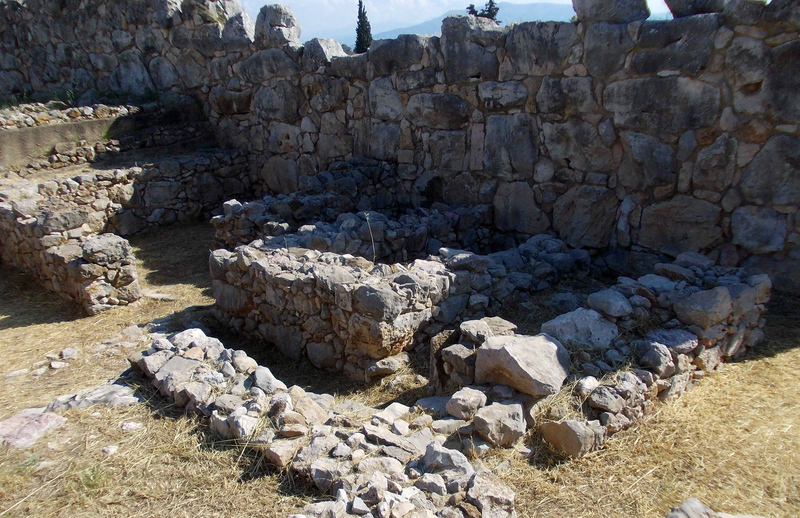 Also two tholos tombs from the late 13th century BC and similar to those of Mycenae have been found 1 km from the fortress. The middle citadel has never been adequately investigated, and it has been covered over to protect it for future excavations. 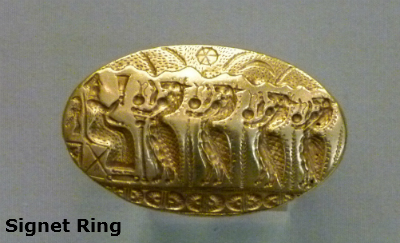 The gold ring from the so-called 'Tiryns treasure' is the largest Mycenaean signet ring yet found and a masterpiece of the Mycenaean seal engraver's art. The bezel is deeply engraved with a ritual scene, while the annulus is decorated in relief. In the ritual scene a female deity sits on a throne at the far left resting her feet on a footstool. She wears a long clerical garment and cylindrical hat, and raises a conical cup or rhyton with her right hand. Four lion-headed daemons carrying libation ewers walk in procession towards the goddess. Various other elements, such as a bird (possibly an eagle), an incense burner atop a short column, and the sun and moon, emphasize this scene's religious character. 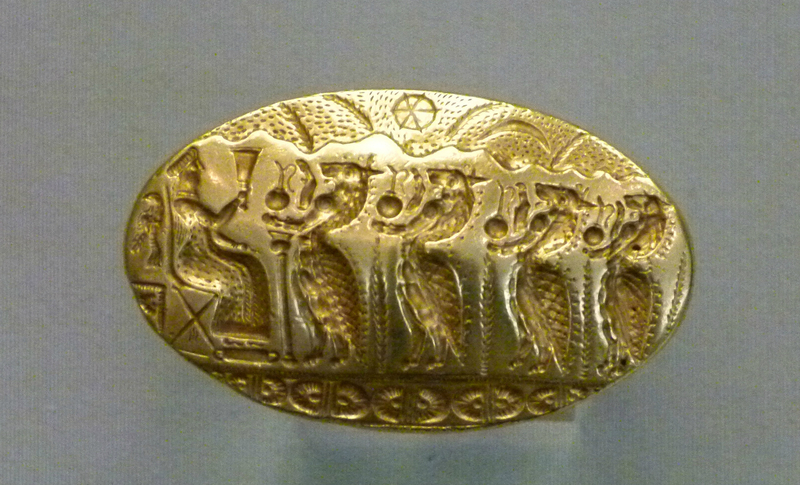 The "Tiryns treasure" was revealed to the northeast of the Citadel, at the foundation of a mycenaean house, in 1915. 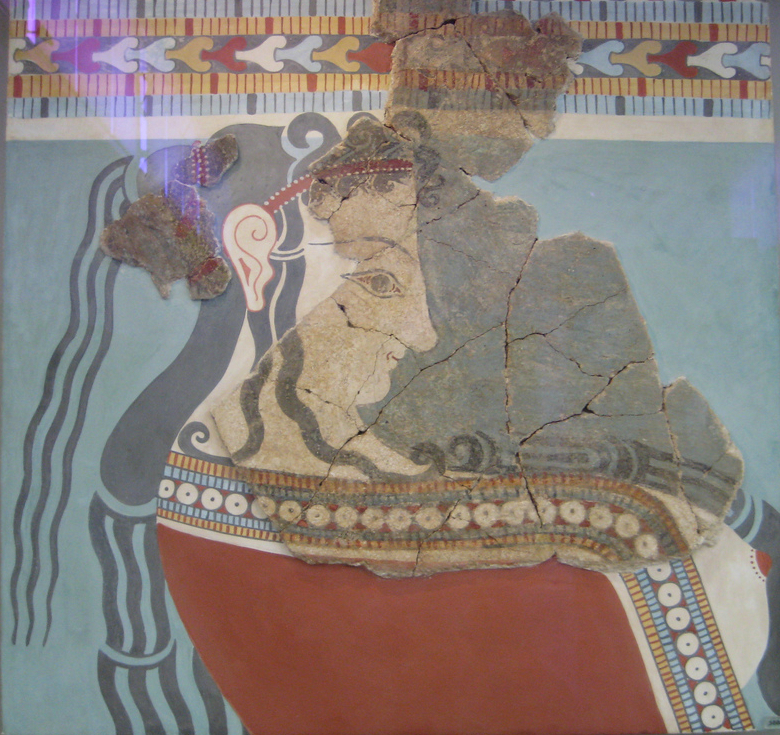 Various Mycenaean artefacts have been found at the site and include fragments of wall paintings showing a male with spear, a boar hunt and a chariot; pottery in Geometric and Mycenaean styles; pieces of floor decoration from the palace depicting octopuses and dolphins; bronze daggers; and jewellery including necklaces and gold rings. Also found, were items of pottery and cult figures from the 7th century BCE. Most of these items now reside in the archaeological museums of Athens and Nafplio. 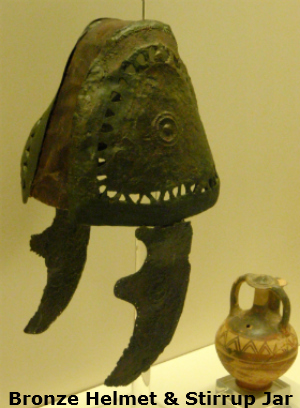 Shown here is Bronze helmet from Tiryns, grave XXVIII. Dated 1050-1025 BC. on display in Nafplio Museum. The walls showing the ongoing excavations and restorations taking place on the site. After the disintegration of the palatial system (about 1200 B.C. 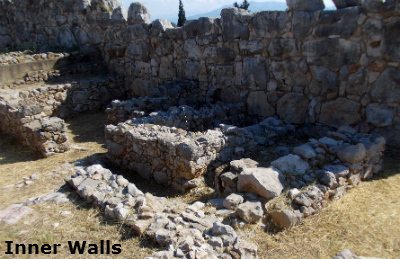 ), the Acropolis continued to be used mostly as a cult place and was deserted during the 2nd century AD. Other Mycenaean architectural structures include damns for flood management, particularly at Tiryns, and bridges built from large roughly-hewn stone blocks. 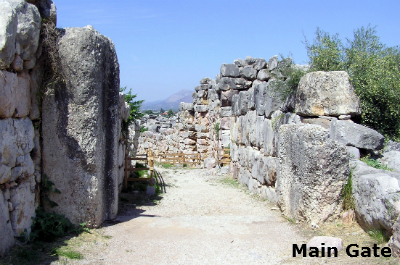 Many organized tour companies ignore it, preferring only to visit Mycenae. It's not in such a magnificent setting as Mycenae, but it's a well preserved example of ancient military architecture, and well worth a visit. When I was at the site in late September there were only 3 other people there. 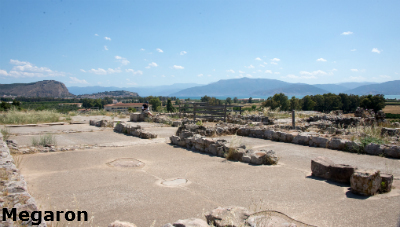 The site is very easy to find as it is right at the side of the road between Nafplio and Argos. There are also signs for the Mycenaean Dam but after following them for a few kilometers I could not find the site.